The Destination: Healthy Skin mobile skin care RV. Colorado’s rarified air makes it an ideal place to recreate in Rocky Mountain splendor, but it also makes the state a prime place to contract skin cancer. Walgreens has teamed up with the nonprofit Skin Cancer Foundation to try to educate people on skin care and ratchet back the Rocky Mountain-high rates of the disease in the state and around the nation. According to the Skin Cancer Foundation, skin cancer is the most common form of cancer in the United States, and in Colorado alone it’s estimated there will be 1,640 new cases of melanoma — one of the most dangerous forms of the disease – in 2018. For every 1,000 feet above sea level, ultra-violet radiation exposure increases by up to 5 percent. For residents of Colorado’s high country, that means that at an altitude of 9,000 to 10,000 feet, UV radiation is up to 45 percent more intense than at sea level. So apply sunscreen 30 minutes before heading out into the sun, reapply every two hours, and don’t even bother with SPF’s (Sun Protection Factors) lower than 30, according to Walgreens pharmacist Susan Barney. “Not at this altitude. This altitude it’s a minimum of 30,” said Barney, who works out of the Walgreens Highlands Ranch store near Denver. Barney marvels at the amount of information now available to people on the dangers of sun exposure – information that’s often ignored. 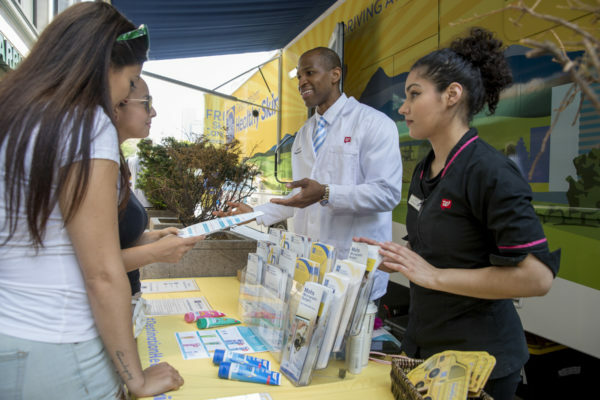 Walgreens has joined together with the Skin Cancer Foundation to support the nationwide Destination: Healthy Skin mobile education program focused on skin cancer prevention and early detection. 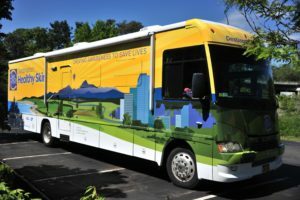 Tuesday and Wednesday, July 17-18, a customized RV with private exam rooms will be at the Littleton Family YMCA on Dry Creek Court in Littleton, offering free full-body skin cancer screenings in private exam rooms by trained dermatologists. Barney says that even if people can’t make it to Littleton this week, they should make time for an annual checkup with a dermatologist. “People should be going at least once a year to have a skin check, especially if they have sun damage,” Barney said. Sasha Campbell, a Walgreens beauty consultant at the Highlands Ranch store, says there are several myths about skin cancer and numerous excuses for not using sunscreen. Campbell also said people with darker skin tones often think they’re immune from skin damage. Then she says it’s harder for people with deeper skin tones to detect skin damage. “When you’re sun-damaged, because you have deeper skin tones, it’s harder for you to find those age spots or moles and you might not be able to recognize it right away till finally it’s noticeable and it might be a little further along than if you had caught it right away,” Campbell said, adding that early detection is key. Campbell also said people with sensitive skin sometimes avoid sunscreen, as do women who think it messes with their makeup. She said Walgreens has products for both situations. For sensitive skin she recommends the Walgreens Baby SPF 50 lotions. “This is great for people who have more sensitive skin, who use the excuse that they break out and they tend to use the baby one,” Campbell said, adding there are also sunscreens that work great with makeup, such as the the No7 Early Defence SPF 30 and the Neutrogena Clear Face, which is SPF 55. 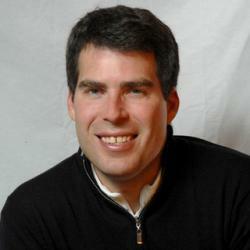 Finally, Campbell recommends the Walgreens Sport Continuous Spray sunscreens. “It’s convenient because it’s a spray, so as you’re doing activities like hiking and biking, it’s quick to take out and spray,” Campbell said. But Barney, the pharmacist, doesn’t recommend sprays in and around the face. Barney also says people taking various medications that make their skin more sensitive, such as anti-aging creams, some forms of birth control, antibiotics or some anti-depressants, should consult their doctor or pharmacist about the right kinds of sunscreens to use. Barney says that overall she prefers mineral-based sunscreens such as zinc and titanium to chemical-based sunscreens but adds that’s really a matter of personal preference. Go to Walgreens.com and search sun care or sunscreens to see all the products offered at the drug-store chain, which has a store locally on Sun Road in Avon. Call (970) 949-8097.